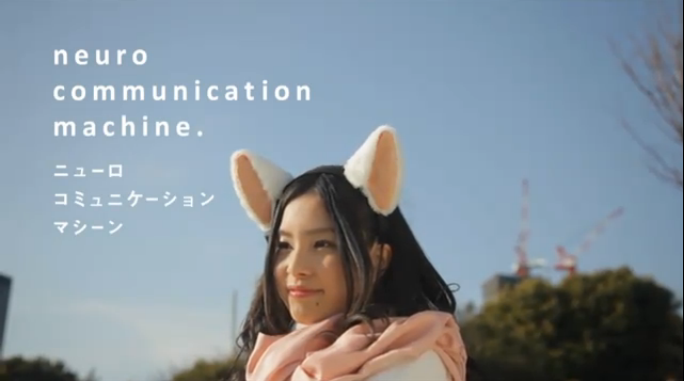 Japanese company Neurowear just unveiled their newest concept piece called Necomimi, a cute pair of cat ears affixed to a headband that picks up your brainwaves, and causes the ears to react accordingly. "Just put on necomimi and if you are concentrated on, this cat's ear shaped machine will rise. When you are relaxed, your new ears lie down. If concentration and relaxing time comes at the same time, your new ears rise and move actively. In general, professional sports players demonstrate their abilities most in this condition." Woahh, ok...hold up for a minute. How many "professional sports players" have actually tried this thing on. I want to see a video of that! Neurowear has also released this video of the ears in action, and it seems to me like they either just randomly move around a lot, or these people are experiencing a roller coaster of emotions! The futuristic accessory is just a prototype for now, and no price or release date has been set, but the company says they plan on continuing to "develop fashion items and gadgets using brain waves and other biosenser with "Augmented Human Body" as the concept." So what do you think? Are Necomimi the "wave" of the future, or are they destined to end up in the great litter box in the sky? Personally, I'm not sure that I need a pair of mechanical cat ears to tell me that I'm concentrating very hard when eating a chocolate doughnut. I already know that very well on my own! I just saw these somewhere the other day and love them!!! Can't remember if it was Mr.Puddy or not...aren't these just the best!?? I Neeeeeeeeeeeeed a pair!! hahahaha! Sooo cute <3 I'd just be giggling all the time haha! !